FlickrWhile an individual room humidifier will be cheaper, a whole-house humidifier will provide much more controlled humidity through the whole home. A whole-house humidifier can have a host of health benefits that go beyond making a scratchy throat or stuffed-up nose feel better when you have a cold. Instead of taking a hot shower or eating a steaming bowl of chicken noodle soup when you get sick, a whole-house humidifier can hopefully prevent illnesses. Dry indoor air can lead to scratchy throats, nose bleeds, dry skin and even static electricity. A whole-house humidifier can especially improve the quality of the air in the winter, when low humidity can cause dry skin and static electricity, says Ryan Rex, who works in the mechanical trades for Evolve Build, a sustainable construction company in Pennsylvania. Allergies and nose bleeds are another problem with low humidity, Rex says. "People with dryer skin can also have problems with the inside of their noses drying out, leading to nosebleeds," he says. "Adding moisture to the air helps prevent this from happening." Installing a whole-house humidifier and keeping the humidity to around 60 percent can eliminate these problems, Rex says. Higher humidity can also render some viruses inactive so that they're less likely to be transferred from one person to another. While an individual room humidifier will be cheaper, a whole-house humidifier will provide much more controlled humidity through the whole home, says Dave Moody, marketing director for Service Experts, an HVAC company. Keeping the humidity level between 45 and 50 percent stops the growth of microbes, Moody says. "Proper humidity levels will keep your wood floors, furniture and musical instruments from drying out, keep your doors sealed and help you avoid dry skin," he says. 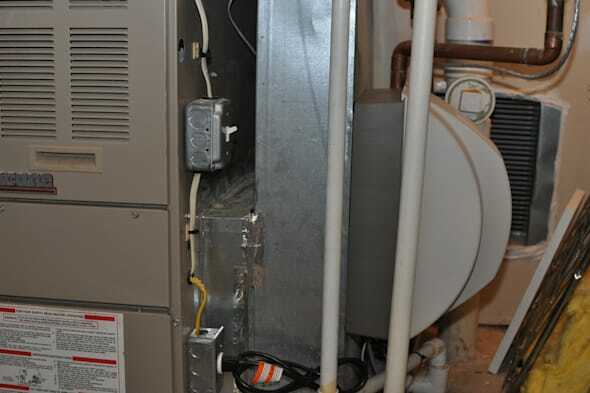 On the downside, he says, whole-house humidifiers require annual maintenance and are more costly than stand-alone room humidifiers. Whole-house humidifiers contain a humidistat, which senses the moisture in the air that the homeowner can control the level of through manual, digital or programmable controls. Some units can monitor outside temperatures and automatically lower humidity levels when it's cold outside. To determine the size of the whole-house humidifier that you'll need, you'll need to do some calculations based on the total square footage of your home and how well your house is constructed. Humidifier capacity is measured in gallons per day of operation. First, measure the total floor area in square feet, and then multiply by the average ceiling height. This will determine the home's approximate volume, which is then multiplied by a figure from 0.3 to 1 to account for the home's "tightness" or degree of leakage. The lower the number, the tighter the construction.